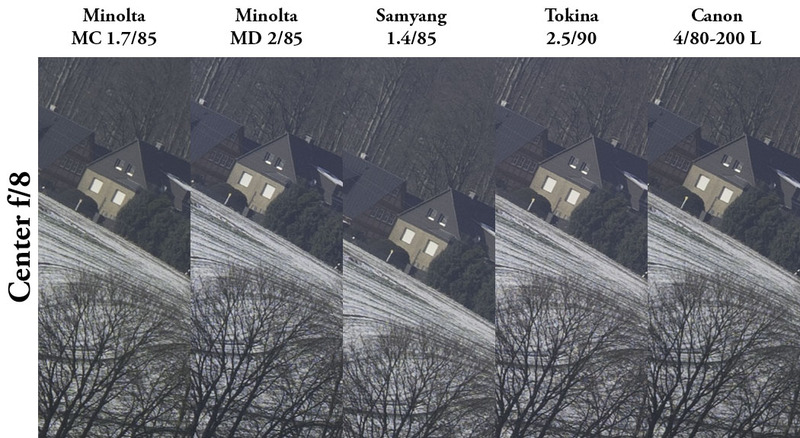 After I published the Minolta List several kind people offered to lent me Minolta lenses so I had a MD 2/85 and MC 1.7/85 plus several of my own lenses and made this test to see where the strengths and weaknesses of each lens are. All ebay links are affiliate links and it is appreciated if you use them, it helps me to keep this site running. I also tested foreground bokeh but the differences here were less noticeable The reason might be that my test setup wasn#t very good. You can find it here. please click on the images to see them at 100%. This copy of the MD 2/85 is decentered which invalidates my sharpness test with that lens, at least in the corners. The lens is built to the highest standards, with a beautifully smooth focusing ring. 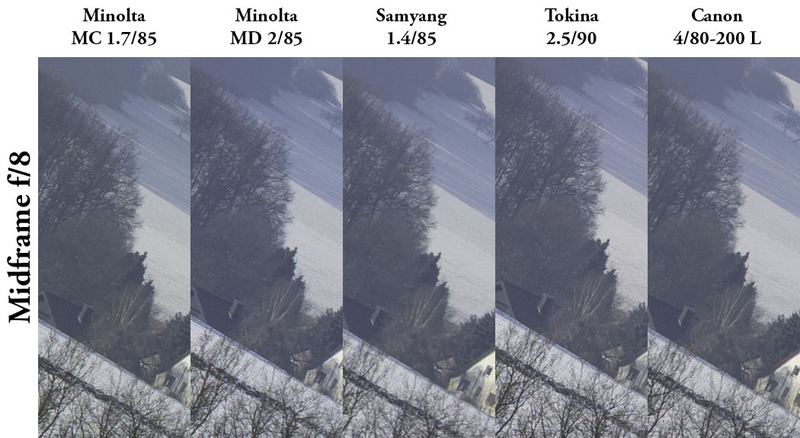 At f/1.7 the lens is a bit soft and the lens is outresolved by the 24MP sensor even in the center. Performance is pretty even across the frame though. Vignetting is quite noticeable and CA is well controlled. I think the lens is a bit sharper at shorter distances than at infinity. f/2.8: The softness is mostly gone, contrast and resolution are good in the center and midframe, the corners only improve a little. f/4: Very good sharpness across most of the frame with good corners. Contrast is noticeably higher than at f/2.8. f/5.6 and f/8: Very good sharpness across the frame, only the Tokina 2.5/90 is a bit crisper. Bokeh at f/1.7 is very nice, I think I prefer it over the Samyang even though it is a bit more rough . At f/2.8 you can see hexagonal structures but the are much less defined and better rounded than those of the 2/85. 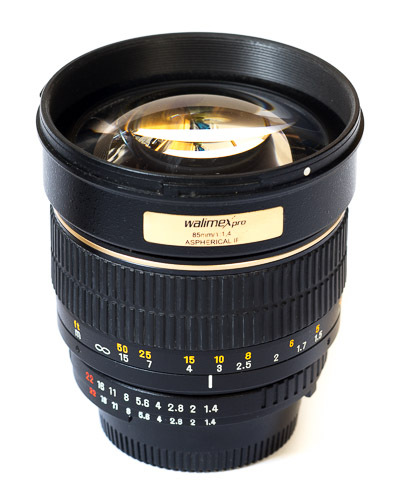 I think this is a very good portrait lens which is also a capable landscape lens but it is rather heavy and bulky. If I was shooting more portraits I would consider buying it. It is really annoying that the tested copy was decentered because I had high hopes for it because of the test on artaphot.ch. 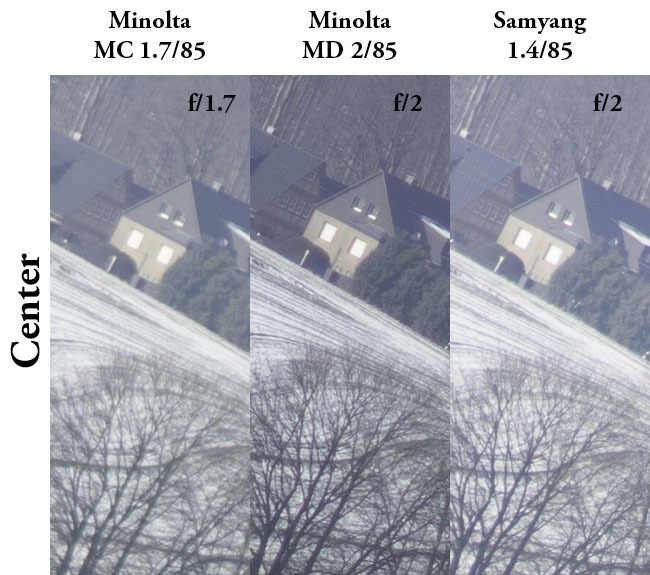 Even the decentered copy showed good contrast and resolution across most of the frame at f/2, noticeably better than the MC 1.7/85 or Samyang 1.4/85. Going by Stephans test a well centered copy should be very sharp across the frame even at f/2. The lens has busy bokeh at f/2, at f/2.8 it is a bit smoother but the hexagonal aperture blades are distracting. The lens is very small and light, not much bigger than you average 1.4/50 lens so it is a great option if you are looking for a small and sharp landscaping lens but I would prefer other lenses for portraits. The Samyang delivered a very good performance at f/2 and f/2.8 with the smoothest bokeh and good sharpness but it does not improve as much with stopping down as the other lenses do. So it is great for portraits and good enough for landscapes but other lenses will give sharper results stopped down. It has 8 rounded aperture blades. Also to consider is that Samyang lenses are known for their poor reliability and the focusing feel is not as nice as with other lenses because it is a bit uneven and resistance is a bit high. The aperture ring is a bit hard to turn. I think it is a good buy if you really need the fast aperture, it performs very well at f/1.4 and has super smooth bokeh. Stopped down it lags a bit behind the other lenses. From f/2.5 the center is excellent, with moderate corner falloff and some PF. From f/5.6 it is excellent across the frame. Few lenses I know are that sharp across the frame. CA control at longer distances is also the best of all the tested lenses. I think the bokeh is the best of all the lenses tested here, it shows significantly less fringing than the other lenses. It has gained the nickname Bokina for a reason. I think it is the best allround lens in this comparison. It is a very capable portrait lens at f/2.5, only the shorter focus throw can be a bit challenging. Stopped down it is the sharpest lens of all the ones I tested here which is nice for landscapes. Oh and it is also a capable macro lens. On the downside I would mention the significant weight of more than 500gramms. For my full review click here. I think the Canon shows a remarkable performance for a zoom lens. From f/4 it is very sharp and contrasty across most of the frame at this focal length. The corners are a bit weaker and not as good as those of the Minolta 1.7/85 but very similar to the Samyang 85. I didn’t include it in the bokeh test but from experience I can tell you that it performs quite well in this aspect with remarkably little bokeh fringing. The lens is very versatile, sharp and it has very little bokeh fringing. Do you think I have missed an important aspect? Just leave me a comment, I am always happy to improve my methods. There is performance difference between the Rokkor version and the plain MD version that you saw or read about ? Would you recommend the MD 85 F2 for general use and mostly for landscape work ? I am pretty sure there is only one optical design for the 2/85, so there should be no performance difference. I think it is a very good lens for landscape work and it would work fine for most applications but the bokeh can be an issue if you aren’t careful to avoid critical situations. The Canon 85mm 1.2 is sharp enough to shoot wide open, and it also gives you a full extra stop of light when compared to the Canon 85mm 1.8, and 2.5x more stop when compared to a standard f/2.8 lens. So it is absolutely killer as a low light lens. Hi, I remember buying my 85mm f2.0 second-hand getting-on for 20 years ago and being really excited about how much better my portraits would be, using my SRT101 with this lens, rather than the MC135mm F2.8, or the non-MC, stop-down 200mm f3.5. In fact I never did take any outstanding images with it; and I traded it on E-Bay last Autumn. The problem seemed to be that the image viewed through the ‘finder did not ‘snap’ crisply into sharpness and much fiddling about was involved, even at f2.0. For my secondary purpose, that of photographing flowers, in combination with a 20mm extension tube, it was a poor performer too; and could not really better the Tamron 35-70 f3.5 AD2 lens. 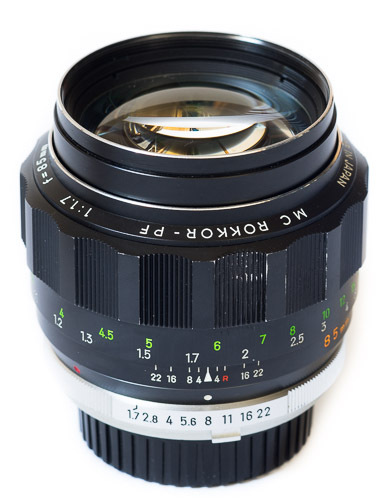 The Rokkor 135/f2.8 was a fiddly-focusser also and had a tendancy towards lower-contrast. The Rokkor 200/3.5 (non-MC) has proved to be a lovely lens for portraits, sport, flowers; you-name-it. I use it wide-open mostly and the results are stunning. I now own a Nikon D600 and, after trying various AiS lenses, I can say that the old Rokkor lenses are superior to their Nikon counterparts, particular the Rokkor HH 35mm f1.8, which is peerless in my estimation. Apparently the Nikon 35mm f1.4 is appreciated for it’s edge-of-frame softness, a feature that endures right down to f5.6. The Zeiss Distagon 35mm f2.0, which I bought, tried, and sold (at a considerable loss) had such flat, poor contrast that it was a poor joke. The difference between the Rokkor and the Zeiss was immediately obvious. 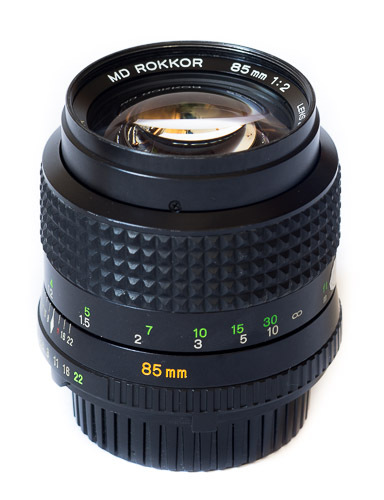 I now have two examples of the Rokkor model HH and intend to find an engineer to modify one lens to accept a Nikon F-mount. After all: there are no issues when using the lens wide-open, at F1.8, which is how it should be. A photograph taken with this lens is like looking into the future: it is so clear. Note : talking with friends, many fast mid-tele suffer of focus shift. I saw it with the Samyang : you focus at 1.4, then you decide to stop down … and the “centre” of focus depth is changed; for best sharpness you have to focus again. True, but not an issue on an a7 body, since you will usually focus at working aperture. One of the nice things about mirrorless. Modest-$, not “cheap”: 1a. Contax Zeiss 85mm f.2.8 Sonnar, AEJ (cheaper) or MMJ (revised coatings); or 1b. Contax G 90mm f.2.8 Sonnar (more aperture blades… more fiddly to focus with adapters — you’ll need a good one). Both are said to be ~87mm FL. 2. Nikkor 85mm f.1.8 H.C. [last version, multicoated, pre-AI]. 3. Minolta 85mm f.2.0 MC/MD (see Artaphot.cz for info on versions and image comparisons). — F.
P.S.- Cheap: 4a. Minolta 35-105mm 3.5-4.5 MD (the ’16-lenser’, not the ’14-lenser’) or 4b. optical twin Minolta 35-105 AF (the first ’16-lenser’ only!). I have 1a, 1b, and 4b. Addendum: Do not discount the Sonnars as portrait lenses. They are good to go across the frame wide open, f.2.8, and are known for portrait rendering. Don’t swallow everything you read on the internet about super thin D.O.F. and “creamy” bokeh. Apparently it was nearly impossible to take a great portrait on small film format before the internet and modern alphabet soup lens technology. ah, perfect – what a good comparison! Thanks for sharing this. Really useful… thinking of which lens to buy atm. I like you fact based comparison. Unfortunately, you are missing my very favourite, the CY Zeiss Planar 1.4/85, which is the lens which motivated me to dump my Nikon equipment in order to buy a Sony A7II which allows me to use my Zeiss lenses again. For my taste there just is no turning back! 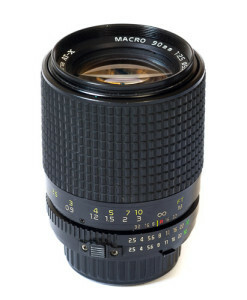 How would these compare to the 85mm F2 Nikon, or the F1.8? They are a bit pricey but I hear they are amazing. I have the Tokina 90/2.5 as well and it’s even better than the Nikkor. In fact, it’s the most perfect lens I have ever had, together with the Pentax-K 28mm f/3.5. Question: Where are the Nikon lenses? I hear their 85mm are quite nice. I’m not a nikon fan boy or anything. If anything I LOVE the performance I get from my Canon FD lenses. I have a Nikon 135 f2.8 and it’s really nice but the focus ring is WAY too tight. But just curious why Nikon arent in the mix. Nikons are usually a bit more expensive than their Canon and Minolta counterparts so I have little experience with them. Another very good zoom in this range is the Minolta MD 75-150mm f/4, it might be a good (and quite a bit cheaper) alternative to the 80-200L. What camera was used for this test?